Bulldogs in England were originally working dogs that drove and caught cattle and guarded their masters’ property. The breed’s strength, courage, and familiarity with livestock led to its popularity in the brutal sport of bull baiting. When this sport was outlawed in England, the original type of Bulldog disappeared from Britain and was replaced with the shorter, stockier, less athletic dog we now know as the English Bulldog. The original Bulldog, however, was preserved by working class immigrants who brought their working dogs with them to the American South. Small farmers and ranchers used this all-around working dog for many tasks. By the end of World War II, however, the breed was almost extinct. 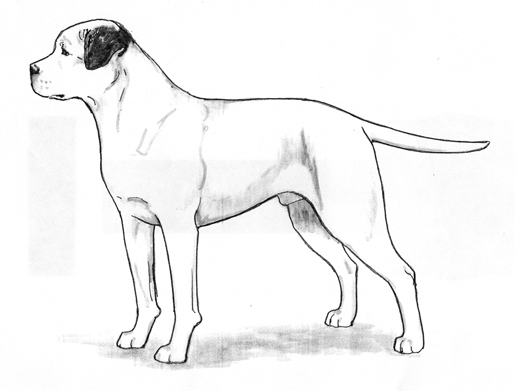 Mr. John D. Johnson, a returning war veteran, decided to resurrect this breed. Along with Alan Scott and several other breeders, Johnson began carefully to breed American Bulldogs, keeping careful records and always with an eye for maintaining the breed’s health and working abilities. Because of the many different types of work this breed can do, several distinct lines evolved, each emphasizing the traits needed to do a specific job. The best known lines are usually referred to as the Johnson and Scott types. The Scott dogs, commonly referred to as ‘standard’, are more of a performance style, athletic dog, sleeker in appearance than the bully dogs, with less bone, longer muzzles, more moderate stop and a less extreme undershot bite. Today, however, many American Bulldogs have crosses to two or more of the original lines and are considered to be hybrid in type, with characteristics of more than one of the original lines of bulldogs. 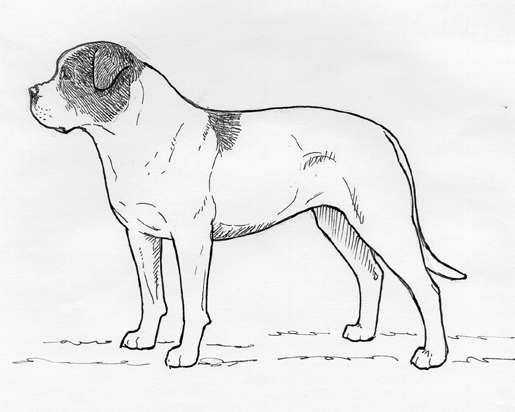 The Johnson dogs, commonly referred to as ‘bully’, are bulkier in body, heavier in bone, with larger heads that have more stop, a shorter muzzle and a more pronounced undershot bite. They generally have more muscle mass as well. The modern American Bulldog continues to serve as an all-purpose working dog; a fearless and steady guard dog; and a loyal family companion. The American Bulldog was recognized by the United Kennel Club on January 1, 1999. The American Bulldog is a powerful, athletic short-coated dog, strongly muscled, and well boned. The body is just slightly longer than tall. The head is large and broad, with a wide muzzle. Ears are small to medium in size, high set, and may be drop, semi-prick, rose, or cropped. The tail may be docked or natural. The American Bulldog comes in solid colors, white with colored patches, and brindle. Gender differences are well expressed in this breed, with males typically larger and more muscular than females. Honorable scars resulting from field work are not to be penalized. The American Bulldog should be evaluated as a working dog, and exaggerations or faults should be penalized in proportion to how much they interfere with the dog’s ability to work. The essential characteristics of the American Bulldog are those which enable it to work as a hog and cattle catching dog, and a protector of personal property. These tasks require a powerful, agile, confident dog with a large head and powerful jaws. The American Bulldog is a gentle, loving family companion who is fearless enough to face an angry bull or a human intruder. Note: It is common for young American Bulldogs to be somewhat standoffish with strangers, and judges should not penalize this. By the time the dog is around 18 months of age, however, the breed’s normal confidence asserts itself. Disqualifications: Viciousness or extreme shyness; cowardice. The head is large and broad, giving the impression of great power. When viewed from the side, the skull and muzzle are parallel to one another and joined by a well-defined stop. The stop is very deep and abrupt, almost at a right angle with the muzzle. Despite the depth of the stop, the forehead is wider than it is high. The skull is large, flat, deep, and broad between the ears. Viewed from the top, the skull is square. There is a deep median furrow that diminishes in depth from the stop to the occiput. Cheek muscles are prominent. In bully dogs, the skull is generally box-shaped to rounded, with a more definitive stop, and more wrinkles than the standard type, which has a skull that is box or wedge shaped. Serious Fault: An excessively narrow skull, in any type. The muzzle is broad and thick, with a very slight taper from the stop to the nose. The length of the muzzle in the bully type dogs is 25 to 35 percent of the overall length of the head. In the standard dogs, it is 30 to 40 percent of the overall length of the head. The jaws are well muscled, displaying great strength. Lips are moderately thick, but not pendulous. Black pigment on the lips is preferred. The chin is well defined, and must neither overlap the upper lip nor be covered by it. Serious Fault: An excessively narrow muzzle in any type. Disqualification: Any dog that exhibits difficulty breathing while in the ring. The American Bulldog has a complete set of 42 large, evenly spaced, white teeth. In the standard type, a reverse scissors bite is preferred, a scissors bite or a moderate under bite (up to ¼ inch) is acceptable. An even bite is allowable but not preferred. In the bully type, undershot approximately ¼ inch is preferred, but any variation from 1/8 inch to ½ inch is acceptable. An even bite is allowable but not preferred. An extreme undershot bite is considered faulty to the degree that the bite interferes with the dog’s ability to work. Teeth are not visible when the mouth is closed. Worn teeth or broken teeth are acceptable. The nose is large, with wide, open nostrils. Black color is preferred, but shades of red or brown are acceptable. Lack of pigment is a cosmetic fault. Eyes are medium in size, round to almond in shape, and set well apart. All colors are acceptable, but dark brown is preferred. Haw is not visible. Black eye rims are preferred. Disqualifications: Crossed eyes. Eyes that do not match in color. Ears may be cropped, but natural ears are preferred. Natural ears are small to medium in size, high set, and may be drop, semi-prick, or rose. Drop ears: The ears are set high, level with the upper line of the skull, accentuating the skull’s width. At the base, the ear is just slightly raised in front and then hangs along the cheek. The tip is slightly rounded. When pulled toward the eye, the ear should not extend past the outside corner of the eye. Semi-prick ears: Same as drop ears except that only the tips of the ears drop forward. Rose ears: Rose ears are small and set high on the skull. The neck is where the American Bulldog exerts power to bring down livestock. The neck must be long enough to exert leverage, but short enough to exert power. The neck is muscular and, at its widest point, is nearly as broad as the head, with a slight arch at the crest, and tapering slightly from shoulders to the head. A slight dewlap is acceptable. The shoulders are strong and well muscled. The shoulder blade is well laid back and forms, with the upper arm, an apparent 90-degree angle. The tips of the shoulder blades are set about 2 to 3 finger-widths apart. The forelegs are heavily boned and very muscular. The elbows are set on a plane parallel to the body, neither close to the body nor turned out. Viewed from the front, the forelegs are perpendicular to the ground or may, especially in a dog with a very broad chest, incline slightly inward. The pasterns are short, powerful, and slightly sloping when viewed in profile. Viewed from the front, the pasterns are straight. The chest is deep and moderately wide, with ample room for heart and lungs. The ribs are well sprung from the spine and then flatten to form a deep body, extending at least to the elbows or lower in adult dogs. The topline inclines very slightly downward from well-developed withers to a broad, muscular back. The loin is short, broad, and slightly arched, blending into a slightly sloping croup. The flank is moderately tucked up and firm. Serious Faults: Swayback; sloping topline. The hindquarters are well muscled and broad. The width and angulation of the hindquarters is in balance with the width and angulation of the forequarters. The thighs are well developed with thick, easily discerned muscles. The lower thighs are muscular and short. Viewed from the side, the rear pasterns are well let down and perpendicular to the ground. Viewed from the rear, the rear pasterns are straight and parallel to one another. Serious Faults: Narrow or weak hindquarters. The feet are round, medium in size, well arched, and tight. Fault: Splayed feet. The seriousness of this fault is based on the amount of splay in the feet. The American Bulldog may have a natural or a docked tail, but the natural tail is preferred. The natural tail is very thick at the base, set low, and tapers to a point. It should reach to the hock joint. A “pump handle” tail is preferred, but any tail carriage from upright, when the dog is excited, to relaxed between the hocks is acceptable. Serious Faults: Tail curled over the back; corkscrew tail; kinked tail, tail that ends in a complete curl; upright tail when the dog is relaxed. The coat is short, close, and varies from soft to stiff to the touch. It is one inch or less in length. Disqualifications: Longer than one inch, any feathering, or a wavy coat. Any color, color pattern, or combination of colors is acceptable, except for solid black, solid blue, merle, and tricolor (white with patches of black and tan). A full black mask is also unacceptable. Some dark brindle coats may appear black unless examined in very bright light. A buckskin color pattern, where the base of the hair is fawn and the tips are black, may also appear solid black. A judge should not disqualify an American Bulldog for black color unless the dog has been examined in sunlight or other equally bright light. Serious Fault: Less than 10% white markings. Disqualifications: Solid black or blue with no white markings; tricolor (white with patches of black and tan); merle; full black mask. The American Bulldog must be sufficiently powerful and agile to chase, catch, and bring down free-ranging livestock. Dogs capable of doing this come in a rather wide range of height and weight. Standards are leaner and more athletic in appearance. Bullys are thicker and more powerful in appearance. Males are typically larger with heavier bone and more muscle than females. Both sexes, however, should have a well-balanced overall appearance and all dogs should be well conditioned, neither over nor under weight. Desirable height in a mature male ranges from 22 to 27 inches; in a mature female, from 20 to 25 inches. In all types, weight should be in proportion to height. When trotting, the gait is effortless, smooth, powerful and well coordinated, showing good reach in front and drive behind. When moving, the topline remains level, with only a slight flexing to indicate suppleness. Viewed from any position, legs turn neither in nor out, nor do feet cross or interfere with each other. As speed increases, feet tend to converge toward center line of balance. Poor movement should be penalized to the degree to which it reduces the American Bulldog’s ability to perform the tasks it was bred to do. Any dog that exhibits difficulty breathing while in the ring. Eyes that do not match in color. Coat longer than one inch, any feathering, or a wavy coat. Solid black or blue with no white markings. Tricolor (white with patches of black and tan); merle; full black mask. The docking of tails and cropping of ears in America is legal and remains a personal choice. However, as an international registry, the United Kennel Club, Inc. is aware that the practices of cropping and docking have been forbidden in some countries. 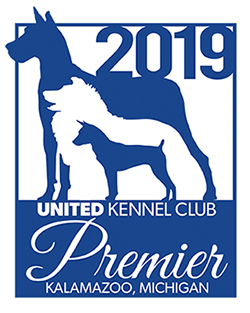 In light of these developments, the United Kennel Club feels that no dog in any UKC event, including conformation, shall be penalized for a full tail or natural ears.